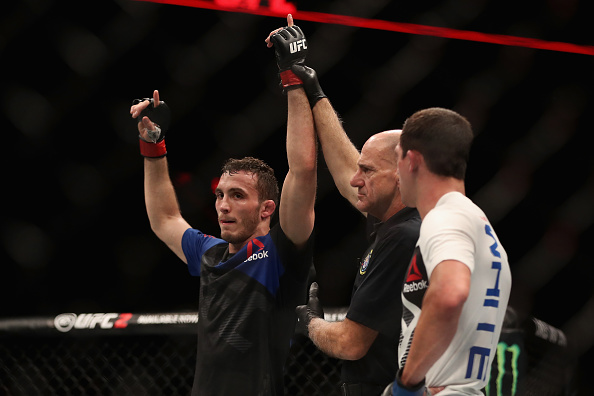 In UFC prelim action at Talking Stick Resort Arena on Sunday, Arizona’s own Drakkar Klose made an impressive Octagon debut, shutting out fellow newcomer Devin Powell in their lightweight bout. Scores were 30-27 across the board for Klose, now 7-0-1; Maine’s Powell falls to 8-2. Klose showed off a little bit of everything in the first round, dominating the action against Powell, who just couldn’t find any daylight in the opening five minutes, and it didn’t get any better for him in the next two frames, with Klose dominating everywhere, but particularly in the clinch, as he kept Powell pinned there for long periods of time. When the two were separated, Powell gamely threw at the Michigan native, but Klose eluded most of the blows while landing several hard right hands and knees in response. 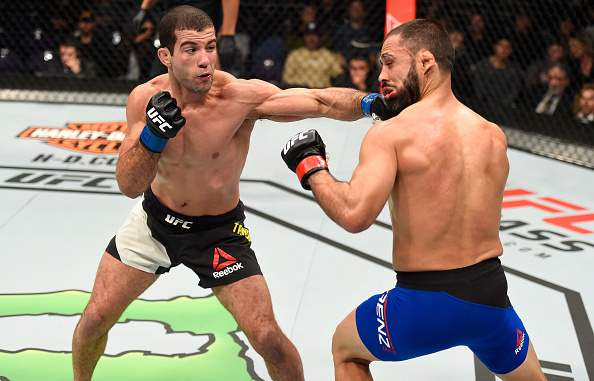 In a clash of Arizona-based bantamweights, Augusto “Tanquinho” Mendes won the local turf war, taking a hard-fought split decision over veteran Frankie Saenz. Scores were 29-28 twice and 28-29 for Glendale’s Mendes, now 6-1; Scottsdale’s Saenz falls to 11-5. The local favorites wasted no time getting after it in the first round, Mendes leaving the first impression with a left hand that got Saenz’ attention. Mendes followed up with a takedown, and while Saenz rose immediately, he went on to eat a few follow-up haymakers that jarred him. 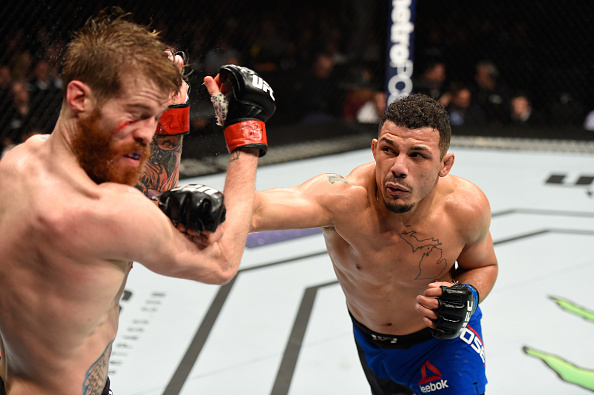 Saenz got rocked with a left hook early in round two, but he got right back into it with a right elbow in the second minute that dropped Mendes. A right hand landed hard on Mendes with under 90 seconds left as well, highlighting Saenz’ spirited run. Mendes may have wrapped the fight up in the third though, with two takedowns and some more solid striking proving to be the deciding factors. 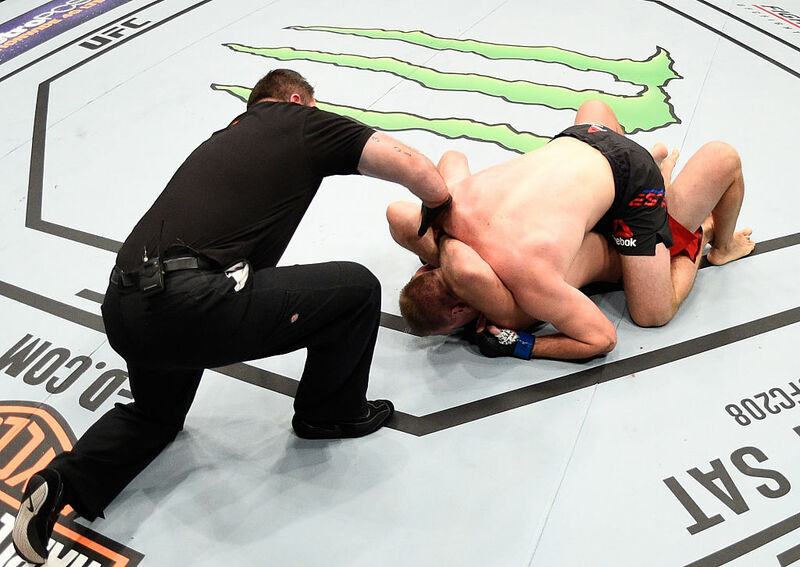 Heavyweight veteran Aleksei Oleinik’s ground game was in fine form once again, as he finished Viktor Pesta in the first round thanks to the first Ezekiel choke submission in UFC history. Oleinik closed the distance quickly on Pesta, bulling him to the fence in the opening minute. Pesta reversed position and the two tumbled to the mat, staying in the dominant top spot. Pesta’s ground strikes opened a cut on Oleinik’s forehead, but it was Oleinik pulled off a remarkable choke from the bottom, forcing Pesta to tap out. The official time was 2:57 of round one. With the win, Moscow’s Oleinik moves to 51-10-1; the Czech Republic’s Pesta falls to 10-4. Tony Martin put in a workmanlike effort in his lightweight bout against Alex White, winning a clear-cut three-round unanimous decision. After a bizarre start in which his protective cup broke and needed to be replaced, Martin got to work and put White on the deck, utilizing his ground game to nullify any attempt at offense by his foe. Martin looked for a kimura while in the top position, and when that came up empty, he began firing off ground strikes, putting a cap on a dominant frame. White got on the board early in the second with a right hand that staggered Martin, but Martin responded immediately with another takedown, and he kept White grounded for the majority of the frame, making it 2-0 for the Boston product. Martin’s grappling continued to rule the day in the third, as he just wouldn’t allow White the space to get his striking game in gear, making it an easy 30-27 call on the judges’ scorecards. Martin moves to 11-3; Missouri’s White, who replaced the injured Erik Koch, falls to 11-3.